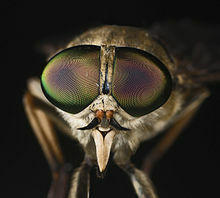 Tabanus sudeticus also known as the dark giant horsefly is a species of biting horse-fly. It is the heaviest fly in Europe. ^ Stubbs, A. & Drake, M. (2001). British Soldierflies and Their Allies: A Field Guide to the Larger British Brachycera. British Entomological & Natural History Society. pp. 512 pp. ISBN 1-899935-04-5. This article relates to members of the fly superfamily Tabanoidea is a stub. You can help Wikipedia by expanding it. This page was last edited on 28 July 2018, at 13:32 (UTC).